Dying is not a subject many of us like to talk about. However, all of us, as well as our loved ones, will die eventually, and before that happens, many of us will need palliative care. 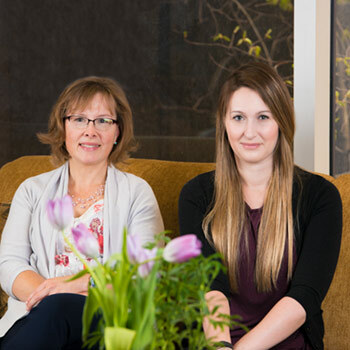 Laurier Professor Dawn Guthrie and master’s student Lisa Harman want to help ensure that when the time comes, we receive the best care possible, whether we choose to die at home or if it happens somewhere else. Guthrie and Harman are analyzing a massive database of home care assessments in Ontario – more than a million assessments collected by home care workers, representing about half a million unique people, says Guthrie. For her nearly finished Kinesiology master’s thesis, Harman concentrated on home care assessments for people who were seriously ill. Her objective was to come up with indicators of home care quality that can be standardized and used across the province. Harman came up with her quality indicators both by analyzing the home care assessments and by interviewing the physicians, nurses, nurse practitioners and palliative care coordinators who provide home care in the community. Some of Harman’s quality indicators that focus on physical issues include the rate of falling, daily pain, and shortness of breath. However, psychosocial indicators are also important, say Harman and Guthrie. One key aspect of home care is that it requires significant involvement by the patient’s family. That’s why another of Harman’s indicators is caregiver distress. Quality indicators can help families and the public in general more objectively understand the care their loved ones are receiving. Standardized indicators could help policy makers and health care administrators understand what is going on in their regions and how they compare to other regions. This understanding is important because currently, there appears to be some disparity within Ontario, says Harman. Harman and Guthrie caution that the indicators don’t necessarily indicate quality of care in a definitive way. They should therefore be treated not as report cards but as flags to help home care clinicians and managers know where to target their quality improvement efforts. For instance, a high prevalence of patients with pressure ulcers – bedsores – could indicate poor quality of care. However, it could also indicate a high percentage of patients in the very last days of their lives. At that point, it can become difficult and painful to move patients, which is necessary to avoid pressure ulcers, says Guthrie. The Canadian Institutes of Health Research funded Harman and Guthrie’s research as a one-year project. It’s a stepping stone to a larger, national-level project Guthrie is currently seeking funding for. The ultimate goal of the larger project is to have a national, clinically tested set of quality indicators for palliative care that can be used in home care or in long-term care and hospice settings, says Guthrie. A better understanding of palliative home care will also help people benefit more and earlier from care aimed at improving quality of life. Not only will this benefit patients, it could save the health care system money, since it will tend to lead to less time spent in hospitals, says Guthrie. Read more about Guthrie and Harman's research on CBC News.